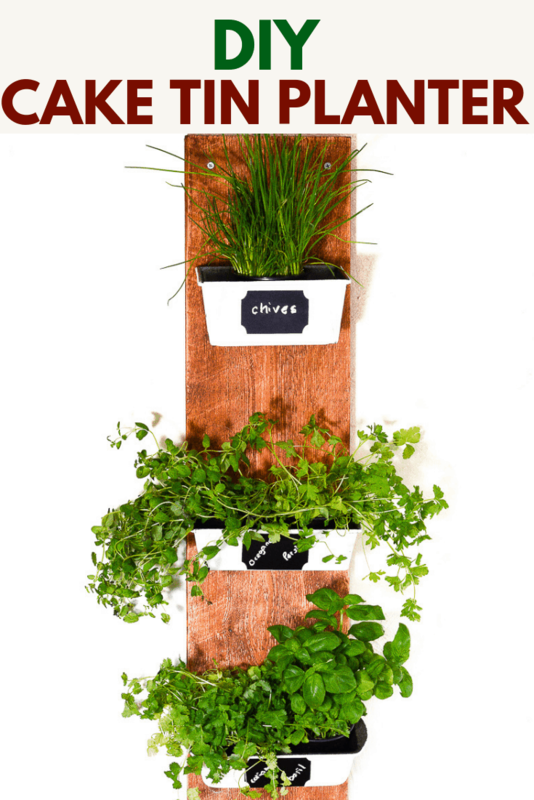 DIY recycled planter – don’t throw rusty loaf tins away! Prepare your baking tins. If they have any flaky rust sand this off. Thoroughly wash to ensure they are completely grease free, I suggest using sugar soap. 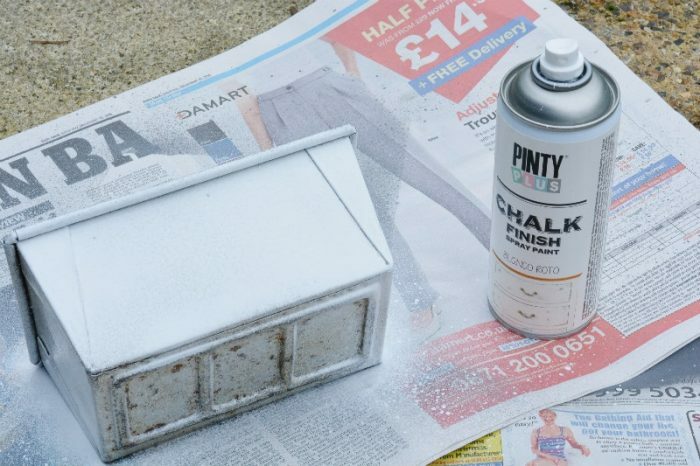 Spray the chalk paint over the outside of the baking tins. It is best to spray a light layer, allow this to dry and then spray with a second coat. The beauty of using Novasol Spray is the paint dry’s in fifteen minutes. Prepare your piece of wood. Saw it to size. Sand to reduce the chance of splinters. 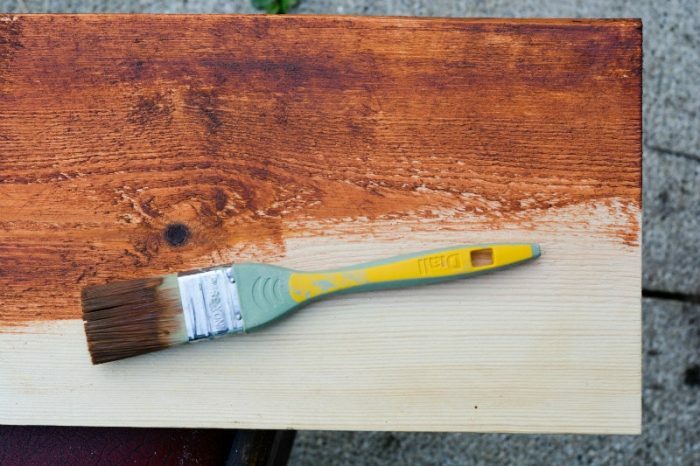 Apply a stain or wax to your wood. This will protect the wood and provide a longer lifespan for the tin shelf unit. Allow to dry. I used Ronseal wood stain satin teak – the darker stain adds contrast to the white tins. Resand for a rustic look. Mark on the back of your tins a straight line to use as a guideline. Drill two drill holes in the back of the tins along your pencil line. Use a drill piece suitable for wood and metal. Measure the plank of wood and your tins. 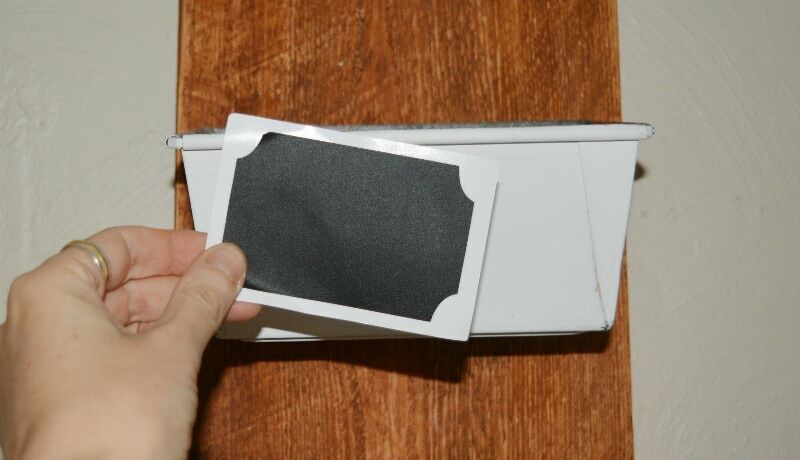 Place your tins in position ensuring they are at right angles to your plank of wood. Using a pencil mark through your drill holes into the wood. Predrill a small hole in the wood at the marked places. Screw the tins into place. Drill two holes an inch down from the top of your plank of wood. Mark on the wall. 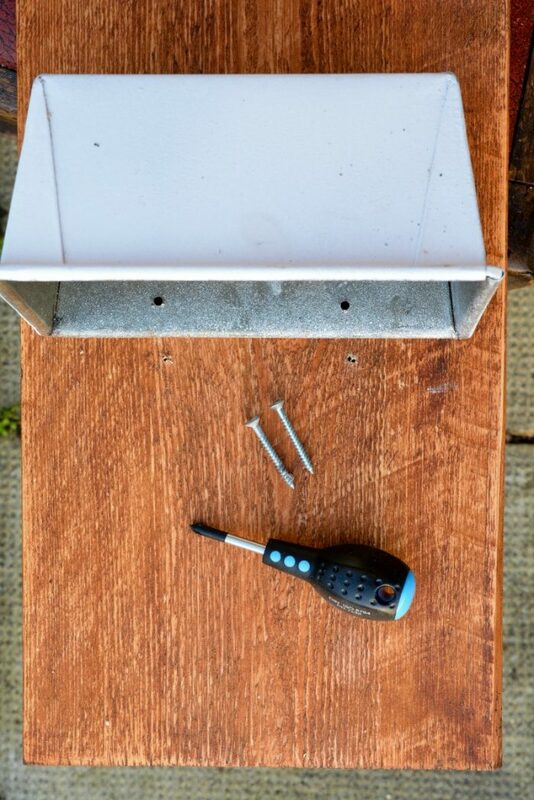 Using a masonry drill piece drill two holes for your screws. Add raw plugs into the predrilled holes. Screw the plank of wood to the wall. Label the tins with chalk paint stickers. Mark the tins with the contents of your shelves with a chalk paint pen, finally fill your tins and admire your handy work! You DIY recycled planter can store anything you, not just plants!! How about as laundry/cleaning materials or packing supplies such as parcel tapes, string, scissors. I have to admit my herbs were rather quickly replaced by cacti! 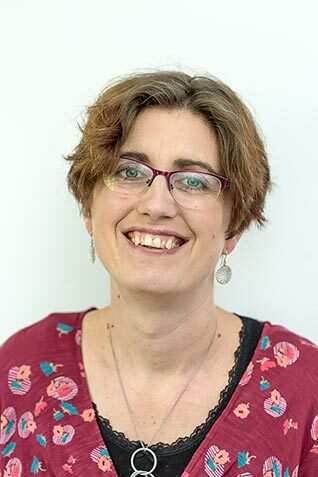 If you would like a handy DIY Top Tips sheet PDF sign up to my newsletter for access to my free resource library. Love indoor houseplants? Check out my leather pot holders, or how about an upcycled Ferrero Roche box as a windowsill planter? "DIY Mans Messenger Bag (post sponsored by Volkswagen)"
Your timing with this post is perfect! I have a relatively new (couple of years old) loaf tin which has just started sticking EVERY time I use it and I was wondering what on earth to do with it,I am SO spraying it! Ooo, that’s clever. I was going to say I still use my tins even if they are a bit worse for wear, but then I saw just how rust these ones you had were! This is a lovely idea to give them a new life. 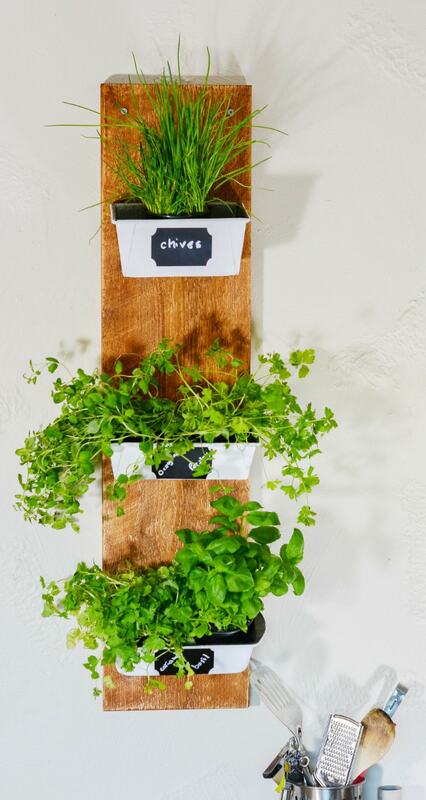 How funny that we should both look at herb holders this month! I love yours, much better to get it up on the wall than sitting on the window ledge as mine does. You have a knack of repurposing things and making them look so attractive. Another great upcycle. I like your idea. I love to try different things and recycle unused items but didn’t know I can reuse the old baking tins. Thank you. 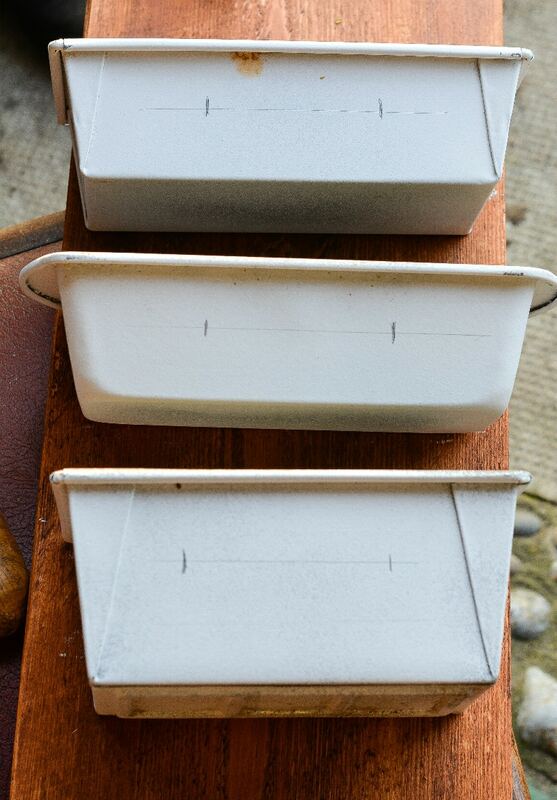 any ideas for a rusty 9X13 cake pan? any ideas for rusty 9X13 cake pan?